Dad’s Memorial Service was held on June 29, 2018, at The Memorial Drive Presbyterian Church in Houston, Texas. It was a beautiful, honorable remembrance of a beloved husband, father, and friend. Several astronauts, Dad’s best friends, and his wife, Leslie spoke at the service. My remembrance touched on Dad’s role as a loving father. Accomplished Aviator, Acclaimed Astronaut, American Artist- Alan Bean was a man of many parts. He led a life of great purpose and distinguished achievements. 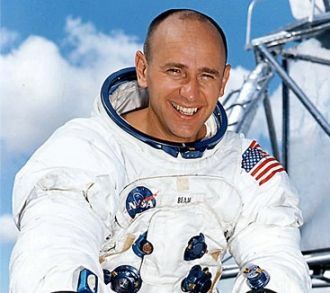 Today as Alan Bean’s daughter, it is my honor to tell you about another role he played, father. When I was a little girl my dad built a backyard playhouse. He poured the foundation, sawed the wood, and drove each nail into its frame. He added a front porch, finished it with 3 small windows, and wood siding that he painted a light green. But the true gift of that little cabin my father so lovingly created was not in the hours it served in a daughter’s world of make-believe, but the cabin’s part in the bedtime, fairytale stories my father imagined. Sitting on my father’s lap, the silhouette of my playhouse through the backyard window, Dad told stories of the little GhostGirl who lived there. Her nights were filled with fun and adventure. While I slept she went night-fishing or played with the cats, raccoons, and owls who roamed the neighborhood. One time the little GhostGirl grew weary of the darkness, and she flew to the sun because a GhostGirl cannot burn. My father’s magical stories always ended the same. From the shadow of the little cabin, the GhostGirl would gaze into our window and see me on my father’s knee. And the GhostGirl would long to be me with a father who loved her and believed she was the most special person in the world. That playhouse has been torn down now. The memories of the days playing in it have blurred, but the tales of the GhostGirl in the little cabin, the love my father conveyed to me will never die. Maybe those childhood fairy tales were the beginning of my father’s legacy as a storyteller. I grew up and left home. Dad began to tell and paint the legendary stories of Apollo and the brave men who flew it. My father had a journal. Over the last year, he shared it with me. Amongst other things, he wrote his thoughts about happiness and love, achieving dreams, overcoming fear, and making each day count. I will be passionate about the things, people, and activities I love, partaking of them as a feast and appreciating their small pleasures. I will have the courage to be me, not afraid of others, or forget who I am in the business of living. I will keep a child’s heart. Be unafraid to lead a happy life. Many things can be done in a day if I don’t make that day tomorrow. And finally, I cannot move the hearts of others, unless I can move my own heart. Thank you Dad for moving my heart. I love you. My mother and children at the reception following Dad’s service. From left to right, James Mellin, Sue Bean, Victoria Mellin, Amy Bean, Cameron Mellin. Very sweet eulogy, Amy. Much love to all of you! Beautiful Amy. I feel like I need to post your Dad’s Rules for Life on my refrigerator where my children and I will see it several time a day. As always, your memories and storytelling really make me think, and also appreciate those I love. I too think of Dad’s Rules for Life everyday! Thanks for sharing your special thoughts and memories of your sweet dad. I am so sad that I wasn’t able to be in Houston for the service. I am so thankful to have met and gotten to know him even just a little. Huge impact on my life and I know I will continue to benefit from his words of wisdom. Hugs. Amy, my heart goes out to you and your family during this time of need. God has blessed you and your family. My condolences to you. What a beautiful work of written art. You master our language in things that you write and that’s a true gift from God. Bless you and your family as I know how much your Dad meant to you all. Was so lucky to meet him twice….he was a gift, lucky us. I am sorry I never got to meet him. It was an honor to meet you and your mother recently to recall his accomplishments, charisma, and artistic talent. Henry, Your Apollo experience was one of the hits of Spacefest! Loved sharing time with you and your family. Not an astronaut. My father was Navy Test Pilot. The story about your father building the play house reminded me of my father. He built me a wooden go cart and I remember him sinking the nails with the same love your dad must have had. Your Dad would (and still is, I’m sure) be very proud of you, Amy. Thank you for sharing this with all of us. I met your father a couple times at astronaut autograph shows. He was always polite and would take the time to talk to guests. He was a great person and will be missed. God bless you and your family! This is really beautiful Amy. Your memories will comfort you. Thank you so much for sharing. My thoughts are with you and your beautiful family. I’m so glad I got to meet your Dad. I was 9 years old when I met your father, and I will never forget that weekend or the conversations we had. He is a hero to me, but he was also such a nice man. He was very kind and generous. He had something about him that made me (and I’m sure everyone else lucky enough to meet him) feel like he believed in you, and wanted to help you be as happy and successful as you could be…doing what you love – in my case aerospace engineering. He was an extremely inspirational man, and I will never forget him. Ms. Bean: As a child of the “Space Age,” your father was (this will sound corny) one of my “favorite astronauts,” based on the interviews with him I have watched over the years – in which his optimistic, live-loving personality really came through! – and my admiration of his truly-inspired, beautiful art. But your sharing about your playhouse and your father’s storytelling to you, and his “Rules for Life,” brings me to tears. I am a licensed counselor, and will be sharing these “Rules for Life,” properly attributed, with my clients. I haven’t read a more-inspiring ideal for living in quite some time. Thank you so much for sharing your father’s heart with us – and God Bless you and your family. you were one lucky daughter! loved reading this! I had the pleasure of giving Alan a tour of complex 16 – Gemini program. He was a gentleman and a sharp astronaut.